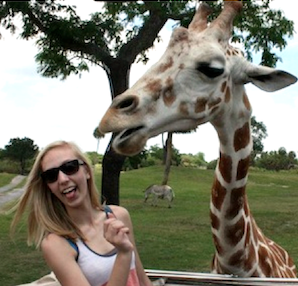 My family just came back from a trip to Disneyworld with friends, we had a fabulous time and I even got to try some things I've always dreamed of doing.... like getting to feed a GIRAFFEEE!! I love giraffes, they're my favorite animals because they're awkward and tall just like me. Giraffes are really funny animals, they only care about you when you have food in your hand, and they have no clue what personal space is. As soon as the safari guide took out the lettuce, a giraffe named Captain booked it over to our truck and shoved his face as close as he could get. It was really funny because he wacked me with his neck in his rush to grab the food. My dad took tons of pictures for me while my brother and I fed them so i could have pictures to scrapbook. So here's the page I made! Hi! I'm Christina H; tall person, general crafter, and definite science nerd. Dreams include owning a golden retriever, being published in a scrapbooking magazine and going a whole week without tripping up the stairs. The Enchanted Gallery is moving to KimCrick.com + artwork now on YouTube and Instagram! Not too cute to ROCK! Taylored Expressions November Sneak Peeks: Wine!